Hey guys! I only didn’t post for TWO DAYS- TWO!! !- and already I feel guilty. (It’s Amy here) I’m so weird. Anyway… I have two books to talk about, but I’ll do separate posts for each. The first I sadly hated. SO LET’S ALL GO BE HATERS!!! 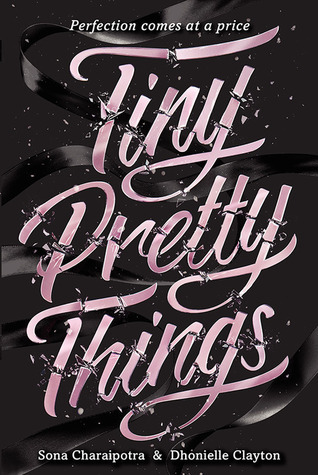 Tiny Pretty Things by Sona Charaipotra & Dhonielle Clayton had an interesting premise, but if I’m going to be honest with myself, there’s no way it could’ve gone any better. I believe I was originally interested in it because I actually used to be in ballet (have I told you guys that? Well, true story- but I stopped when the teacher started to only offer pointe lessons for my age group. I have seen the disfigured feet. ), but it took forever to come in to the library and the suspense built and built, so I got more and more excited about it. The three main characters (the ones whose point of view we saw) were Gigi, June, and Bette. Gigi was the new girl, black and from California, so she was nothing like the other girls, who were already trained to be hateful and take revenge on their friends for any little reason. Her family was loving and caring. June was half Korean, and didn’t know who her father was. She had a serious eating disorder (I don’t know what it’s called when you don’t eat anything but what you do eat comes back up) and was extremely underweight (less than 100 pounds at 16 years old- yikes!). Bette- Bette was probably the worst. She had been in her sister’s shadow from the start, because Adele got the part of Sugar Plum Fairy (I think) when she was Level 6 (I believe). Her mother was awful; almost always drunk, abusive, and just plain cruel. Bette was high for about 90% of the book, and her best (and only) friend was Eleanor, who essentially did everything she said. She used to be friends with Will, who Henri suspects she made drop Cassie (Henri’s girlfriend) while doing a lift. She was prepared to do anything and everything to be on top, no matter what the cost. I haven’t even spoiled anything, honest! (This book is approximately an inch thick.) Shall we talk boys? First- Alec. He starts the book as Bette’s boyfriend. They have always had an on and off relationship. While Bette is used to getting all the lead roles, so is Alec. They have never been paired with anyone other than each other. However, they begin to grow apart, and that is when he decides to move on from Bette, which causes her to become destructive, depressed, and even vicious, if that makes sense. Will is Alec’s best friend, and he used to be Bette’s as well. He has red hair and it is fairly well-known that he is gay. Will definitely doesn’t like Bette. Henri is probably the creepiest of the guys. As I mentioned before, he is Cassie’s boyfriend. Will dropped Cassie (who was playing the big part in something the year before) during a lift, causing her to be severely injured and have to stop dancing. Henri believes Bette caused this to happen. However, the way he “controls” Bette… Yeesh. I really didn’t like the guy. As for the plot, I won’t spoil anything, but Bette and June start pulling pranks on Gigi and basically just doing awful things to her. The book just got worse and worse as it went on and the story just built and built. At some point it was just going to have to fall over. The thing is… If this book were a tower or something, it would need a whole new foundation. Essentially, I’m trying to say that this plot completely fell through. Honestly, there was really no storyline. The entire book was: Girl hates girl. Girl gets a better part than girl. Girl takes revenge. Girl takes revenge. Girl takes revenge. Continue that for hundreds more pages, and you just discovered the plot. To get to my point, there was pretty much no plot, except for one word: revenge. Tiny Pretty Things had a bad ending as well. It wasn’t conclusive, and it wasn’t interesting enough to qualify as a cliff-hanger, in my opinion. It was just like the rest of the book. So after thinking about all these points of the book, I still wasn’t sure if I liked it. I actually compared it with the Hunger Games- HG was all death and war, but I still liked it. However, I think that it interested me on a whole different level than TPT. I really had to ask myself: Did I enjoy reading Tiny Pretty Things? Would I read it again? My answer was no. As I was reading, I know for a fact that my mouth was open in horror 99% of the time. It left me with a great sense of displeasure, and I definitely don’t want to experience that again. I even ended up not liking Gigi! Overall, I didn’t like this book in the least, and I definitely would not recommend it. I hope that if you read this book, you enjoy it a lot more than I did! I had very high expectations, so maybe that contributed to my hate. Oh- remember (those few of you that followed us back then) Thoughts On a Whim? Did you guys like that? Do you think you would enjoy reading those again? Alright, I’ll be a-goin’ now. Toodles! Have you read Tiny Pretty Things? What did you think? Did you hate it or love it? Why? Do you plan to read it? Did you plan to read it before seeing my post, or are you still going to try it? What did you all think of my edits? Aren’t the little girls so cute? But really, the edits? How are you doing? Come say hi! All you have to do is push that there button down below and type a little something! 🙂 I love comments! ‹ PreviousJust a Little Healthy Competition! Next ›New Years, Books, and Hugs!!! Thank you! I’m glad you liked it, but with everything that went on in the book, I just couldn’t. I have never read the book but I still really enjoyed reading your review. I don’t think I will read this book now but I still found it interesting to read about your opinion. Thank you so much! Well, I really don’t think it was worth the read, so I don’t think you’re missing anything. Thanks again! Hmmm… Perhaps try searching it in WordPress Admin, or adding it to your blogs and getting rid of the old one? Aw! Sad ): ~ I actually never even read a synopsis of this before so I can’t really say I had any expectations. The only thing I can say that I like based on your review is the diversity of the characters. P.S. To answer your question on my blog: It better be Erik or I will cry all the tears. Absolutely, the entire book was diversity. However, it was also just all over the place. Haha. But I can’t see it being anyone but Kyle! I haven’t read this one, but I feel like I wouldn’t enjoy it much from your review. Revenge stories can be very hard to read, and it doesn’t seem like there is anything redemptive at the end to lighten it up a bit. It’s too bad this was a disappointment! Absolutely. Like I said, the ending had no happiness whatsoever. Completely awful. Exactly, I had high hopes for it! Hahaha, the death and war of Hunger Games as applied to ballet dancers makes perfect sense. And I’m glad you decided not to wreck your feet by doing non-stop pointe work. Yeah, some people might not get that, but the books were actually quite similar! 😉 I wasn’t a serious dancer anyway (it was just for fun) so it wouldn’t have been too much, but… Like I say, I have seen those feet. Gross! Hmm, interesting review. I’m intrigued by the Hunger Games comparison, but it also sounds like the plot relies a bit too heavily on pranks. And that in-between ground for endings is so terrible – if there’s going to be a cliffhanger, I want there to be a REAL cliffhanger with crazy suspense. I think I’ll still give this one a shot, but I’ll definitely keep in mind what you said about the plot so as not to get my hopes up. Thanks so much for commenting! I really feel the HG similarity, because of all the sabotaging. Definitely. Well, I hope you enjoy it! I feel like I had much too high of expectations for a book I knew nothing about. 🙂 Let me know what you think! My goodness, this cover is pretty! But I may just have to pass after reading your review. Isn’t it though! Yes, it’s really too bad that the book was awful because COVER LOVE.